The song of the season this year seems to be Frank Loesser’s classic from 1944, Baby It’s Cold Outside. Except, oddly, when you listen to the lyrics, they’re actually quite creepy. 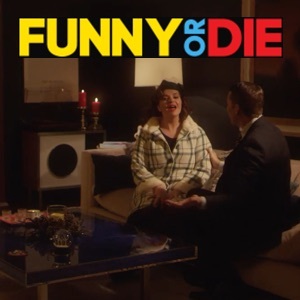 The folks from Funny or Die decided to tap this irony this Christmas season, and I produced the music for this “honest performance” of the song, performed by Casey Wilson and Scott Aukerman, who also star in the video. The unusual back story to the song is that Loesser wrote the lyrics to be a duet between “mouse” and “wolf,” which explains the predatory undertones. Somehow, the sentimental nature of the song has morphed it into a Christmas classic, though many people pay little attention to its unusual lyrics. In the video, the couple begin a romantic winter evening together and then start following the tangents of the song to their logical conclusions. I can guarantee that you will not hear this song in the same light again, after this unforgettable rendition.